So who is Jolene Carr? Well she is the main protagonist in Just Two Weeks. She is the woman with the driving force behind the novel. And this is a little bit about her. At 36 Jo has had an interesting life with many ups and downs. Her mother is an ex- hippie who dragged Jolene round Asia when she was a child. They slept in hostels and cheap guest houses while Jo’s mother searched for her perfect man. Unfortunately Jo only has a vague memory of her father who died of a heroin overdose when she was three. Jolene didn’t get off to a good start. When she ran away from home at 17, she sank to the bottom of the pile. She was homeless for a couple of years, squatting in a disused hospital and got in with a ‘bad crowd’. But after three years of this she decided, not wanting to end up like her mother, she was sick of this life and got into university to study for a degree in Social Anthropology. She worked hard and got a first. But Jo has always tended to play to hard too. Until she met Mark she drank and took cocaine when she could . And slept around. Like her mother she was looking for the perfect man. Like her mother she was never given the chance to get to know her father. In many ways, Jo is unsure of herself. She has two main girl friends, Lisa and Amy and she is fiercely loyal to them all. She confides in them though never confides in her mother who she feels never listens. Throughout her life she is haunted by the loss of her father. And Raquel, the enemy in Just Two Weeks preys on this emotion. Jo has long dark hair which she often puts up. She loves jewellery and doesn’t have much of a sweet tooth. As a rule she lives in jeans and dresses as casually as the situation will allow. She doesn’t like her nose which she thinks is too big and used to dye her hair bright pink. But these days she doesn’t colour it at all. Lucky for her she doesn’t have one grey streak. I am very fond of Jo. Even though we are very different, I have a lot of time for her. She has no mean qualities at all. Perhaps the only downside to our friendship is her unreliability, her forgetfulness. Once she had her phone switched off for such a long time I was really worried about her. Turned out she’d misplaced it when it slid onto the floor under the passenger seat in her car. And she has a tendency to make stupid decisions which often backfire. But she’s really a lovely person. Jo has a soft side to her character. Probably because of her past she is sympathetic to people down on their luck. She’s an easy target for hawkers and enjoyed her work as a Housing Officer in the local authority where she worked with people who were at risk of becoming homeless. She is pretty, laughs a lot and falls in love easily, quite often with the wrong man, but really there is only one man for her. You will have to read Just Two Weeks to find out who this is! And it isn’t Mark. 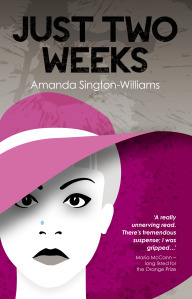 There’s such a lot to this character, Amanda, and the fact that you have thought her past out so well explains why she feels completely rounded in the novel. I feel like I want to know even more about her now! i thought the best way for me to get to know Jolene was to meet her, so I downloaded the book a few minutes ago. A review will be posted as soon as I’ve got my act together. I’m underway with another book right now and I always concentrate on one at a time. Enjoy! Thanks for the purchase! Thanks for your comment. A pleasure to meet you both! 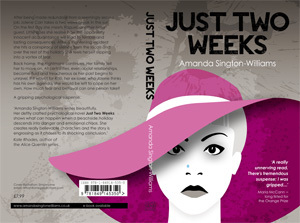 Amanda Sington-Williams Writer · Published author of novels and short stories. Digital PR, ePR, PR 2.0, Social Media PR ...it doesn't matter what you call it.